Vales Point coal-fired power station owner, Delta Electricity, will purchase most of the output of the 275 MW Darlington Solar Farm in New South Wales under a deal that both sides see as a demonstration of the growing role of renewable energy. Edify Energy already has a number of large scale solar projects under its belt, including Gannawarra, Whitsunday, Hamilton, Daydream and Hayman solar farms. Delta Electricity has contracted a total of 150 MW of solar power from the 275MW AC/332MW DC Darlington Solar Farm, which will be one of Australia’s largest solar PV projects once completed. The power purchase agreement has been inked with the project developer, Edify Energy, which expects to reach financial close and commence construction shortly. “This PPA is a cornerstone document to facilitate the financing of one of the largest solar farms in the country,” Edify Energy, Chief Executive, John Cole. 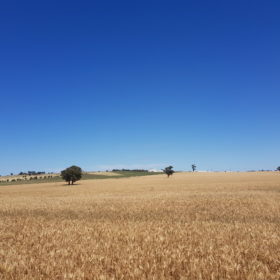 The massive solar farm planned to be coupled with a big 100 MWh energy storage facility was approved by the NSW Department of Planning and Environment last week, as state bureaucrats approving nearly 500 MW of solar PV. Located near Griffith in western NSW, the Darlington Point Solar Farm will generate 685,000 MWh of renewable energy annually, enough to power approximately 130,000 homes and create up to 400 local construction jobs with commercial operation is slated for early 2020. Power from the solar farm will be used to support Delta Electricity’s expanding retail portfolio with acquired large scale certificates being surrendered to help meet its Renewable Energy Target liability and any future emissions compliance. In a joint statement, the two companies describe the PPA as an example of solar working together with coal in NSW, demonstrating the growing place of renewable energy. “Delta recognises that both dispatchable power and low emission technologies have a role to play in supporting an affordable, reliable and sustainable national electricity market,” said Delta Electricity company secretary, Steve Gurney. The companies note that the agreement ends in 2030, coinciding with both the end of the RET period as well as the current expected operating life for Vales Point Power Station. Combining the output of the solar and coal-fired power plant is not new for Delta Electricity. The company is also developing the 55 MW Vales Point solar project alongside the aging coal plant on the shores of Lake Macquarie, NSW, as one of the first large scale solar power plant in Australia to operate in conjunction with a coal-fired power station.